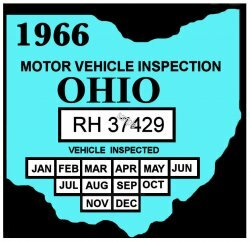 1966 Ohio state inspection sticker - $20.00 : Bob Hoyts Classic Inspection Stickers, Add a Final Touch to your Restoration! Ohio began a statewide inspection program in 1966. We would like to pay a fair price for any that you may want to sell us that do not appear on this site. We will also produce a free reproduction for any good photo, (Front and back) that you send us. This 1966 Ohio sticker was carefully restored both front and back from a faded original. We believe it to be the correct color but if you discover otherwise, please send us a photo or an original so we can correct it. It has our "Peel and Stick" format which allows you to place it on the inside of your windshield.